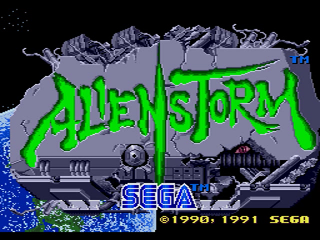 Alien Storm is a port of Sega's futuristic arcade brawler, developed by the same team who made Golden Axe. This version slightly mixes up the level layouts but otherwise plays like the original. Vicious predators from the far ends of the universe are invading our planet! They're mean and wicked, creating havoc everywhere they go! No one is able to end this turmoil, until a group of courageous citizens known as the "Alien Busters" takes charge! 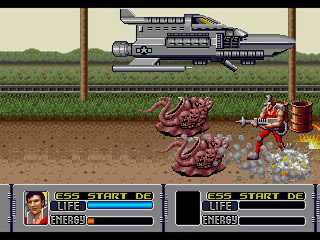 Be a Buster and take on giant winged worms and multi-faced beasts. But beware - they have the ability to turn themselves into whatever they want - even humans! Blast your Fire Blazer and sizzle mutants 'til they smoke! Chase crawly critters down highways with your almighty Thunder Bazooka! If that doesn't work, summon the Gunship or the Ballistic Missile! That should do the trick! But the battle isn't over yet. 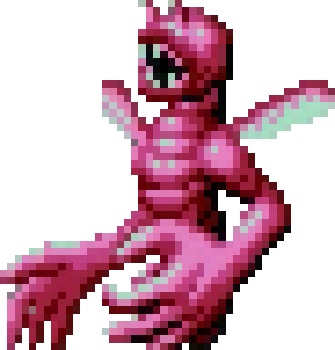 In your final mission you face an incredible creature with terrifying powers. You'll need a full load of tricks, weapons, and strength to save the world and come out alive! 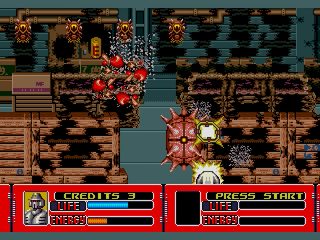 The Genesis version spreads out the boss fights, but in the arcade version all the bosses are fought all at once near the end of the game. This game's style seems to be largely inspired by Ghostbusters. 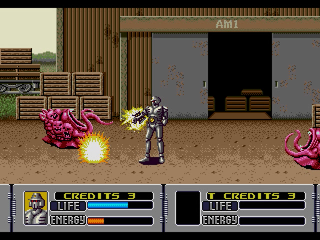 The power packs on the character's backs are particularly similar. 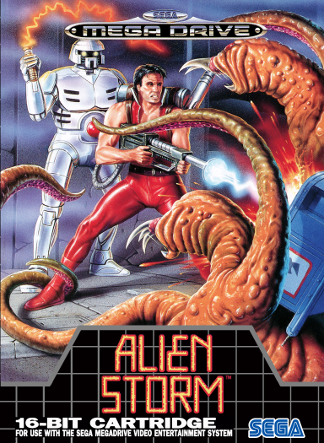 Alien Storm is a great alternative to Golden Axe. It has similar gameplay and way more variety. 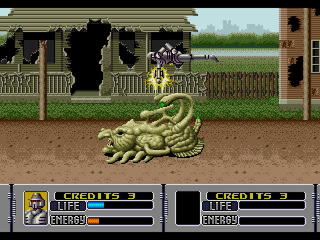 The Genesis version is slightly superior to the original because the bosses are spread out instead of being encountered all in a row at the end. 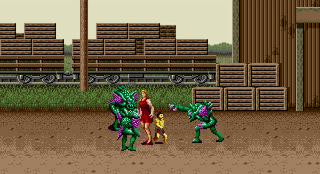 However, its enemy variety and graphics aren't great.